New Boulder apartments for rent located directly across from the University of Colorado CU Boulder campus. This fantastic apartment community is Boulder’s newest student apartment rentals and designed for upscale off campus apartment living. Featuring fully furnished, individually leased 2, 3, and 4 bedroom apartments. Each apartment includes separate locking bedrooms with private baths, spacious common area and a kitchen equipped with a stove, refrigerator with icemaker, microwave, dishwasher and full-size washer/dryer. High speed wireless internet and cable TV with HBO is included. Additional apartment amenities include an outdoor gathering area with a fire pit, the community center is equipped with a lounge seating area, poker table, flat screen TV, billiards table, wireless cafe, state-of-the-art fitness center and computer lab. This unique facility also features underground bicycle storage and covered parking is available. If you’re looking for new Boulder apartments for rent this property will not disappoint. Boulder apartments for rent interior view. Apartment Rental rates: (as of the date of this listing) $900 to $920 per bedroom. Bedrooms can be part of a two, three, or four bedroom apartment home. Utilities: Type of heat – Gas. Resident pays: electricity,phone,gas. Owner pay: sewer,water,trash,cable. Apartment Amenities: Air Conditioning,Clubhouse,Exercise Facility,Hiking/Biking Trails Nearby,Mountain View,Patio/Deck,Students allowed,Washer/Dryer included,Furnished. Location: Walk to class in minutes! Located directly across from the CU Coors Events Center, The Province is just a few minutes’ walk or bike ride from campus. Pedestrian tunnels both to the North and South of The Province give easy access to all campus facilities. About the apartment community: An iconic Boulder landmark has been transformed into The Province’s spectacular student community center complete with panoramic views of the Colorado landscape. Featuring an outdoor gathering area with a fire pit, the community center is equipped with a lounge seating area, poker table, flat screen TV, billiards table, wireless cafe, state-of-the-art fitness center and computer lab. This unique facility also features underground bicycle storage and covered parking is available. The student community center is the best place to study, relax, or attend one of our weekly fun resident social events. 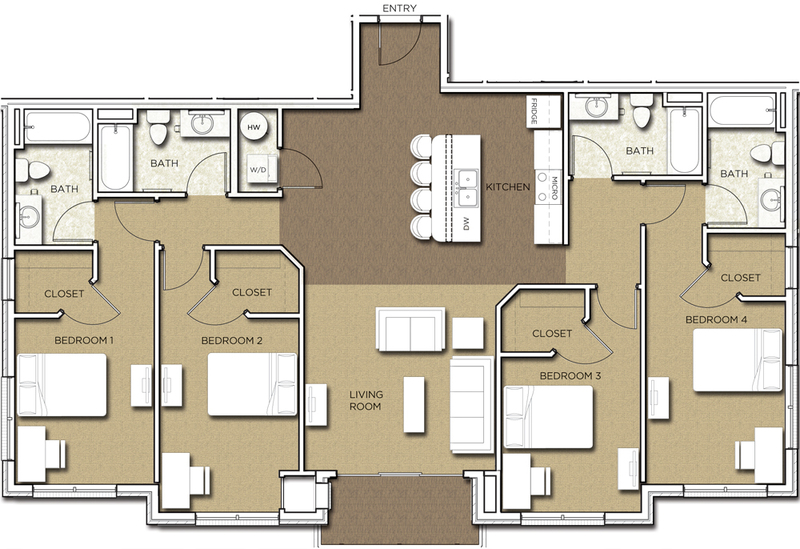 This is an example of the four bedroom floorplan. There are several other floorplans availablefor rent that not shown here. For availability and leasing information call Housing Helpers Boulder at 303-545-6000. Visit our leasing office at 2865 Baseline Rd Boulder CO 80303. We are open 6 days a week, Monday through Friday from 8:00 am to 6:00 pm and Saturdays from 9:00 am to 5:00 pm. Our friendly relocation specialists are available to help you discover these new Boulder Apartments For Rent! This entry was posted in Boulder and tagged boulder apartments, boulder student rentals, New Apartments on October 6, 2014 by John Iannone.